Our little topo map gives you an idea of this charming walk in the Eagle Pond and Little River sanctuaries in Cotuit, led by Farley Lewis.. You park in either the small lot on Putnam Avenue or on Old Post Road (T02P08). Starting from the latter, the walk goes north to circle Eagle Pond, crossing Little River and Little River Road (T02P09), to reach the north shore of the pond (T02P10-12). Then you work your way south, staying west of Cordwood Road, which is now developed. Crossing Old Post Road, you come to a splendid sight of Cotuit Bay (T02P13). 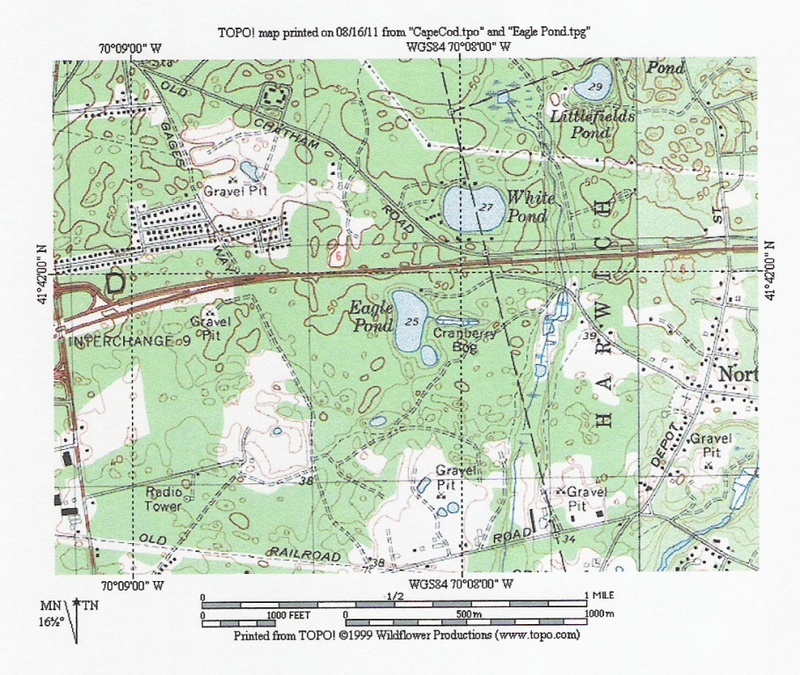 Reverse to circle a swamp (T02P14-16), then north to the south shore of Eagle Pond (T02P17-19). Retrace the route south to (T02P19) and the starting point. About 3 miles. One of the favorite short walks of the Appalachian Mountain Club has been led by Harry Dombrosk, Al Johnson, Janet Kaiser, Farley Lewis, and Heidi Moss. We also include it in our Walk the Length of Cape Cod, together with Sketch Map. Each person has a different route through the area, therefore the waypoints on the topo map are merely schematic -- meaning you have to plan your own route. The start is almost always from the firehouse on Meetinghouse Way (Route 149), just north of exit 5 from the Mid-Cape Highway. Park at the road west of the triangle, north of the church, and walk north to the firehouse and around to the rear. At the northeast corner of the rear parking lot is a trail with a billboard (001). This is one entrance to the John Jenkins conservation area, but it is often called "Deacon's Farm" after the 17th century church deacon who owned it. At the fork, if you turn right, you are headed to (009), and the cemetery. You could then walk to Spruce Pond via Pine St., Parker Road, and the trail to the east around Sandy Hill Pond and Spruce Pond. You used to be able to cirle Spruce Pond, but the trail is overgrown. If you continued east, you would be walking that leg of "Walk the Length of Cape Cod", in reverse, back to exit 6 and the parking area there. You can reverse to (005), circle around the cranberry bogs to (004) and (003) and return by Church St. or Pine St. More recently, though, hike leaders have been taking the scenic route through the conservation lands from (001). It is impossible to describe, but the trail is continuous after the fork, to (002). At (003) on Parker Rd. is another entrance to the John Jenkins area, marked by a billboard. From there, you can return, or continue to Spruce Pond, and come back on Pine St. Carry a compass to assure your party that you are working your way to the east, and will eventually come out to the paved road. Your total distance may be from 4 to 6 miles.